When it comes to food, it appears we’re coming full circle, back to the basics, but with a touch of flair. In the past, succulent home-cooked meals which satisfied both palette and spirit,took hours to prepare, and were eventually replaced with time-saving microwaved fare, minute rice, and take out. Harried income earners working 50-60 hrs. a week often gulped dinner, only to leave the table feeling full, but also empty – of satisfaction. Along came Alice Waters and California Cuisine prepared with organic, locally grown ingredients, and food became fun once more. Homes were remodeled to include open concept kitchens where family and friends could join in preparing easy, fresh, delicious meals, while cookbook sales soared. Entertaining has become “casually” elegant, with dinner invitations more spontaneous, as we share what we’ve grown in our gardens or found at the farmer’s market. In days past, dinners often required a printed invitation and/or elaborate preparation. 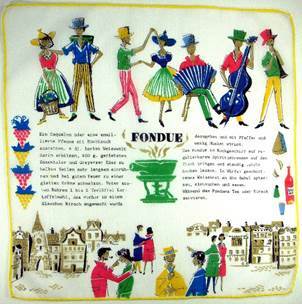 Menus for galas or celebrations were often printed on linen napkins like those shown below. 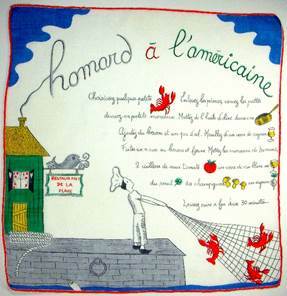 Interestingly enough, many of these menu hankies would be the perfect souvenir for a casual get together today. Whether formal Cornish hen or skillet fried chicken, Finnish artist Ritva Coffron’s fun, celebratory images spell “Let’s Celebrate” and perfectly embody of our opening quote. 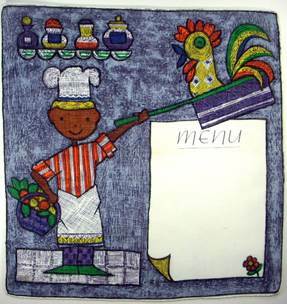 Another pair of menu hankies awash in a bounty of fanciful food images. Note the brown folds lines on the left indicating this hankie was lovingly stored, possibly for decades, but sadly, never used! And how many of us have postponed entertaining, waiting for the right opportunity, right mix of people, right season, right dish, yet none of that really matters. All anyone really hopes for is to be invited. All ages (note the ruffle collared baby at 6:00 o’clock) and classes convene around the border to nibble, sip, and celebrate. 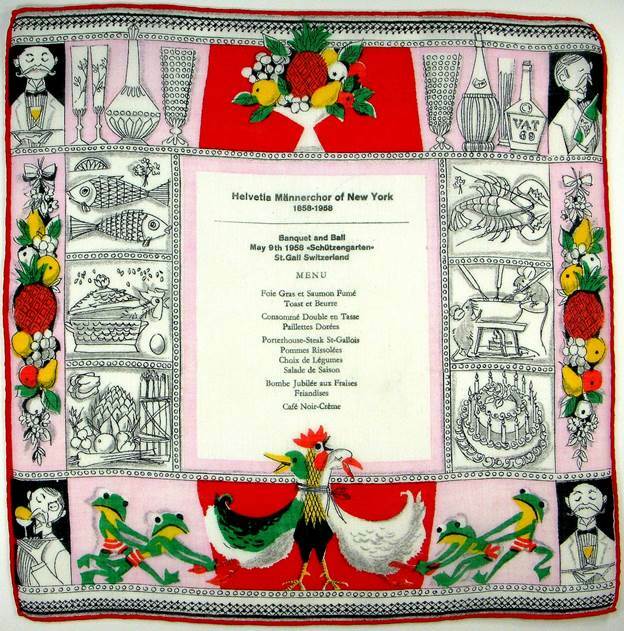 I love the border of this hankie, imprinted w/the menu for a banquet & ball. 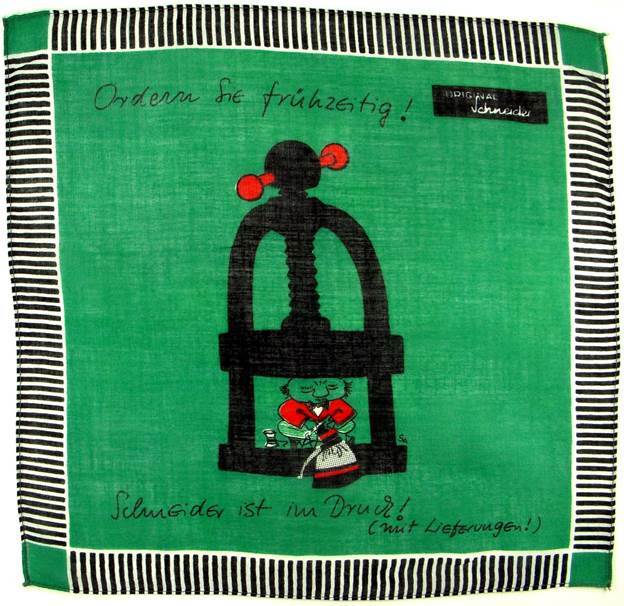 The artist had a great sense of humor, allowing mice to frolic in the cheese fondue, while frantic frogs (in striped swim trunks!) beg the ducks to depart tout de suite! 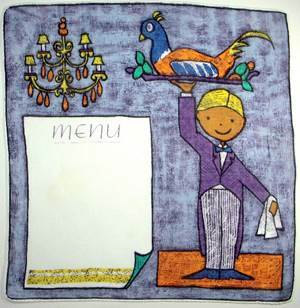 Note the waiters anchoring each corner with wine, sorbet and aperitif. The balance of color to black and white illustrations is perfection. What a grand reminder of a fun event. 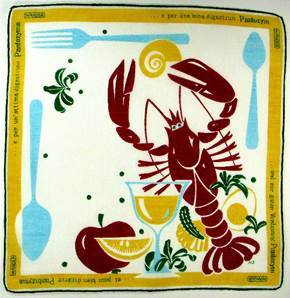 Lobsters capture center stage in these souvenir hankies. I particularly like the layout of the one on the right. 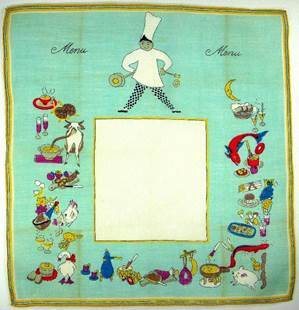 In addition to menus and advertising, handkerchiefs often carried recipes. 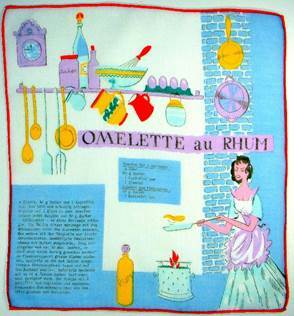 You’ll find more than twenty recipe hankies in French Cuisine. 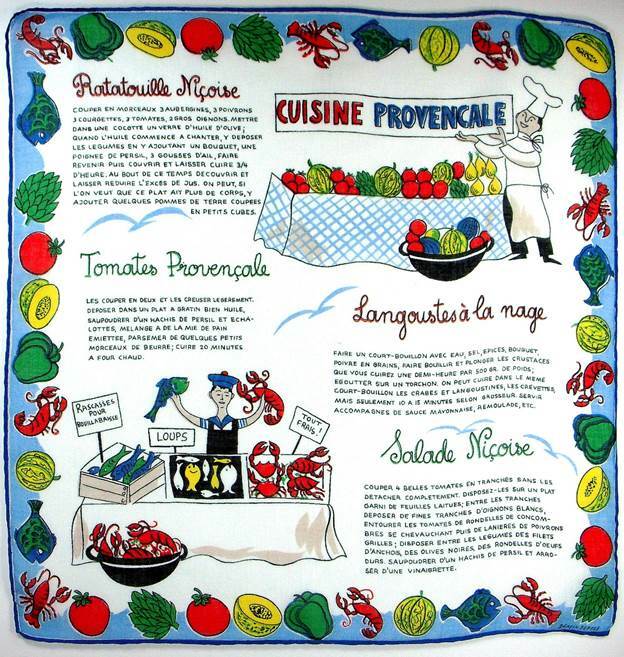 Below, colorful crustaceans frolic with fruits and veggies around the border of this recipe quartet. 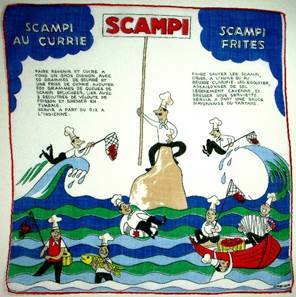 Lobsters form the basis of yet another recipe in this charming hankie, while two recipes for scampi are showcased alongside. 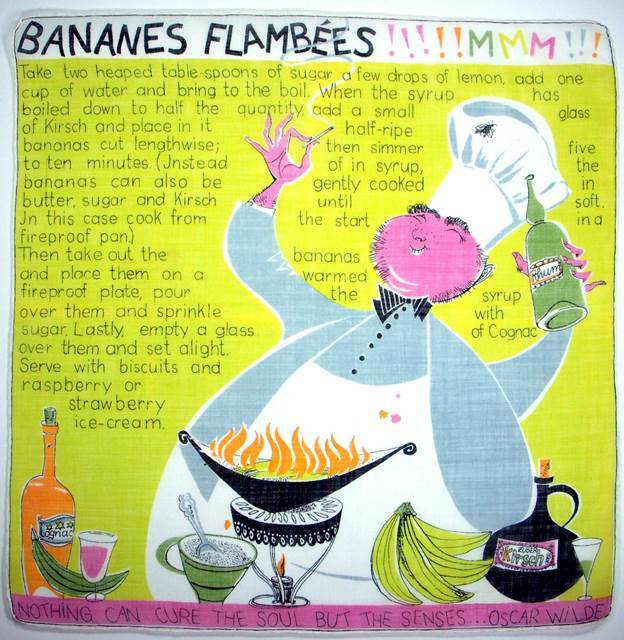 With a lit match in one hand and bottle of rum in this other, this pyromanic chef could well be “lit” by the cognac and kirsch or just the simple joy of cooking. Either way, no detail is overlooked, from the fly on his toque to the spots on his apron. He’s having a merry old time. 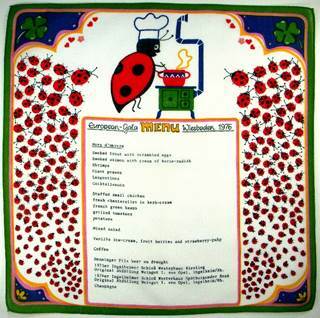 Rhum appears again in a creative omelette recipe, while a good luck ladybug assembles the troops to assist with a gala in Weisbaden. 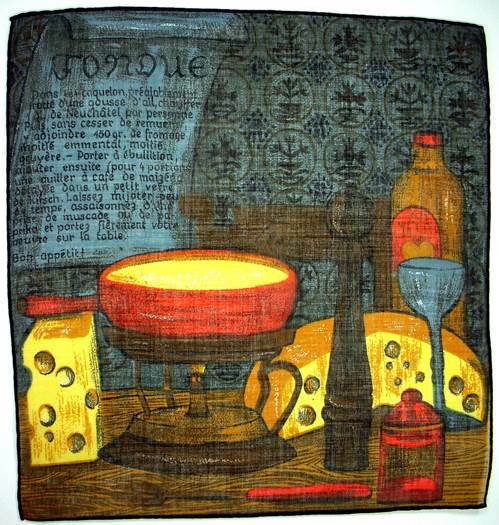 Two fondue hankies reflecting the congenial atmosphere of communal eating. 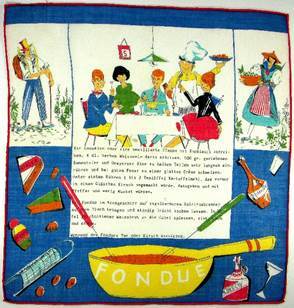 Here’s a German translation of a fondue image often found on handkerchiefs, placemats, and tea towels. It’s sophisticated, handsome, and very 1960s in design. 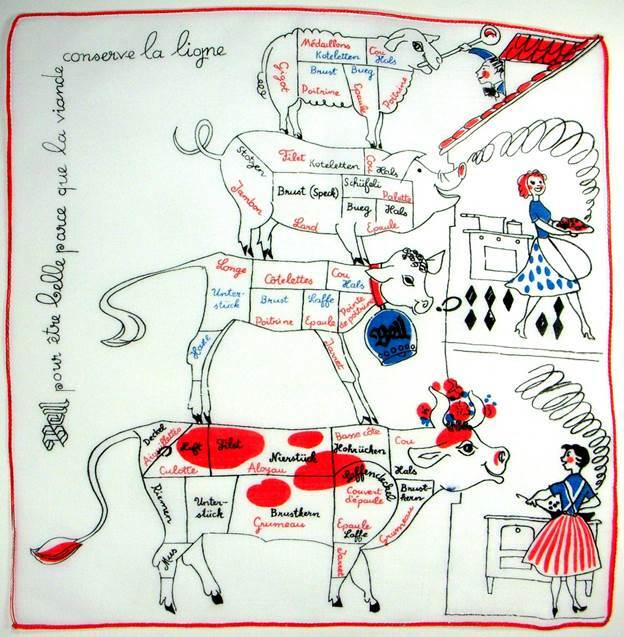 Love this vintage 1950s hankie made by Stoffels (a Swiss textile company now part of Christian Fischbacher). 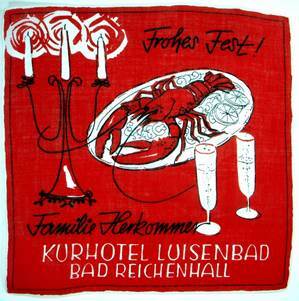 It features the recipe for the meat and potato dish Zürchertopf. 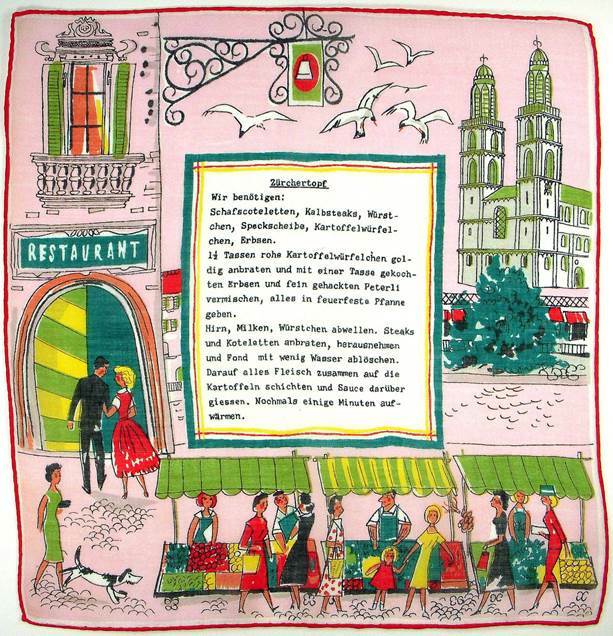 Apparently the gals in front are shopping for their ingredients, while the lucky girl in the background will have her Zürchertopf brought to the table. 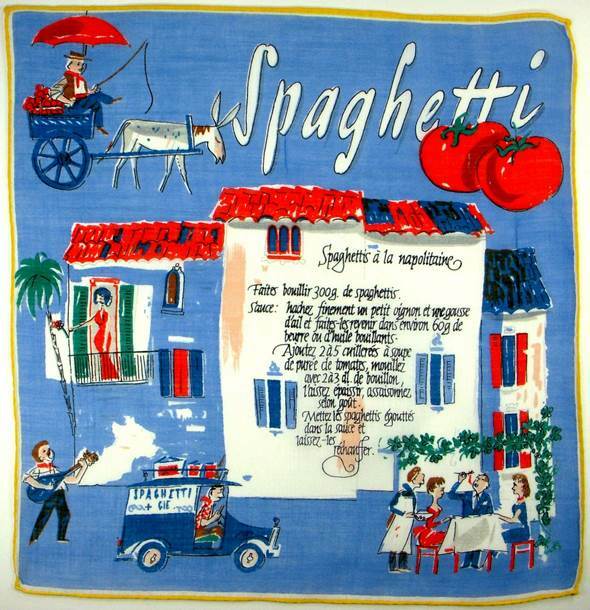 Ah, but what would food be without Italy? 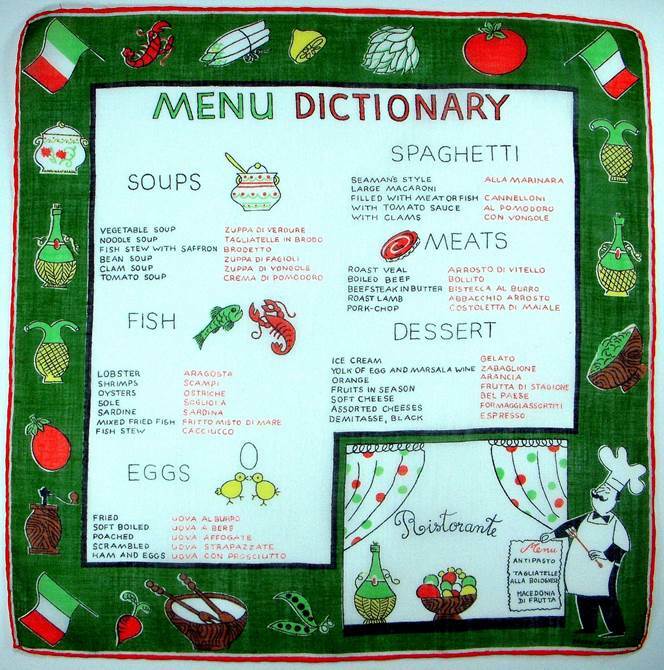 Here’s your cheat sheet for deciphering the menu. 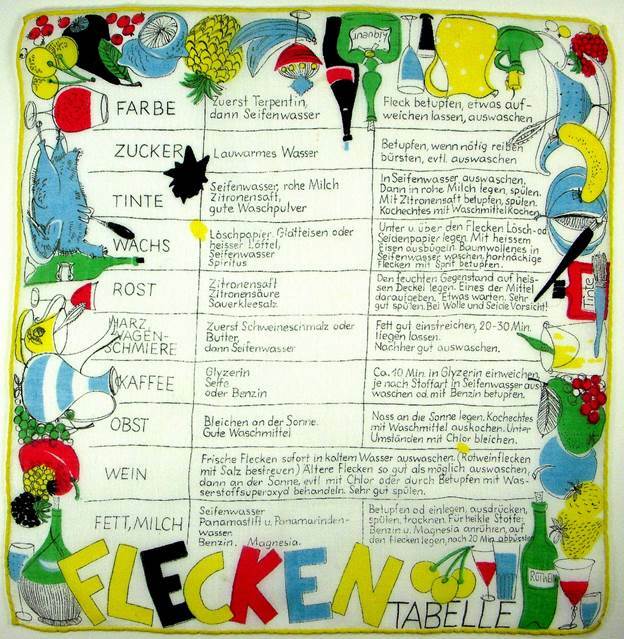 Before tackling all these recipes, it could be helpful for a novice to learn the cuts of meat – labeled in both French and German. 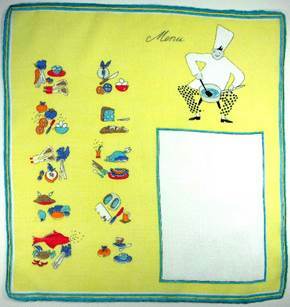 What a great hankie – clever, simple, straightforward, and thorough. 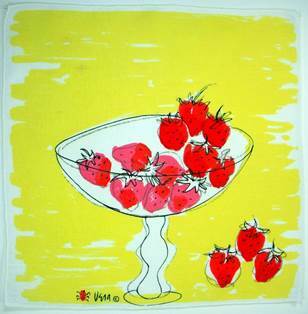 So enjoy with relish and abandon your menus, meals, friends, dinner parties, and your messes in the kitchen. It’s all worth celebrating. 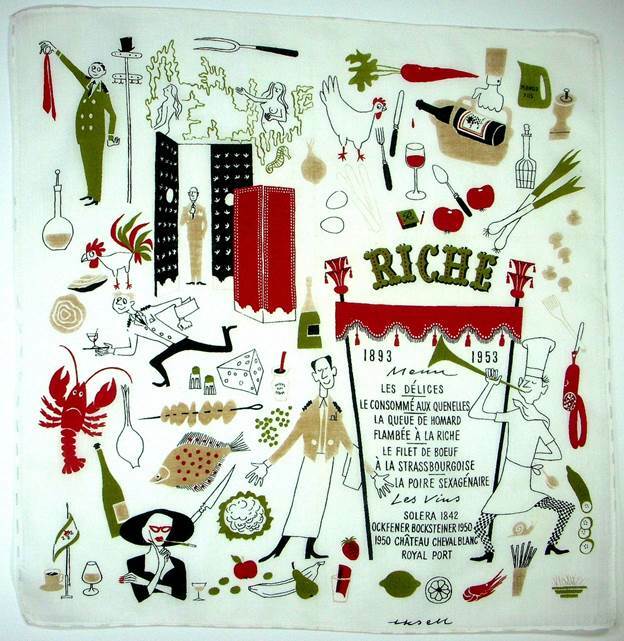 What a fabulous Restaurant Riche handkerchief from 1953. Everyone is smiling, and the joint is jumpin’. You just know dinner will be a delight. 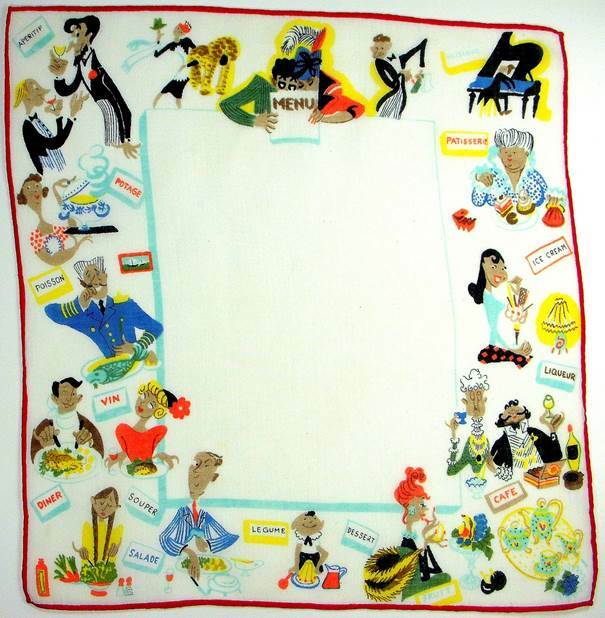 Their website describes Riche as “the heart of all things fun in Stockholm.” Apparently they have “a legendary kitchen with an equally legendary bar, all filled with legendary guests and a legendary staff…” It’s gratifying to find this hankie survived for 53 years. But the again, the restaurant has been going strong for 123 years! You can find great food many places, but to create that ambiance of conviviality + relaxation + professionalism which keeps patrons returning again and again is a skill as vital as having a master chef in the kitchen. Enjoy the time lapse photography which underscores their welcoming “You are right where you are supposed to be.” Oh take me to Riche, please! This month, find an opportunity to play with your food, whether via cooking class or all-out hot fudge madness. 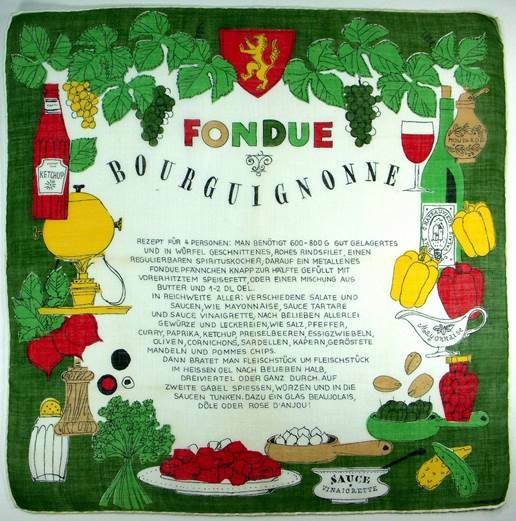 As discussed, the ultimate “play food” is fondue, particularly chocolate fondue. Have you ever attended a wedding where they have a chocolate fountain? The adults barely give the kids access to the waterfall of pleasure. It reminds me of a club in San Francisco which hosts Family Night Buffet on Sundays. Rather than waste servings of roast beef or petrale sole on children who barely touch their plates, management wisely provides hot dogs and chicken nuggets for the kids, which they scarf with relish. As long as they eat a veggie or two, moms are happy and everyone has a great time. The best people watching however, is at the Sundae Stand. A small portable freezer filled with tubs of ice cream sits beneath a stand loaded with every imaginable topping – hot fudge, butterscotch, sprinkles, m&ms, the works… Inevitably it’s always dad who escorts little Jimmy to the stand and announces, “Let daddy help you.” Dad proceeds to build a volcano of ice cream dripping with every imaginable sauce and topping, wherein mom promptly reprimands “Henry, NO!! !” Thereupon dad feigns chagrin, sets his masterpiece aside, and proceeds to make little Jimmy a scoop of ice cream with a dinky sprinkling of toppings. Dad and Jimmy return to the family table where dad digs into his diabetic delight, which was exactly his plan from the start. The lip smacking smiles of satisfaction are something to behold.